We decided to go to the famous Lorenzo and Son’s for our first trip. The pizza was big and good. It was thin but very filling. I did not even finish my pizza because it was so big and filling. I drunk Orange Crush soda. I put oregano on my pizza and we’re lucky that we go on Tuesday because it is Topping Tuesday and we can also get mushrooms and olives if we want. They had no bathrooms so my brother had to hold it in until we found one in The Lite Choice. They had some seats but they were tooken up because there weren’t that much. So we had to walk all the way to the South Street bridge and sit on the grass right before you got on the bridge. This got 2 slices out of 4 because they had no bathrooms and tables but the pizza was big and good and the employee was nice so it got 2 pizza slices. Posted on August 13, 2013 by Jacob	• This entry was posted in Center City, Lorenzo and Son's, South Philly and tagged Center City, Lorenzo and Son's, South Philly. Bookmark the permalink. I love the idea of your blog! 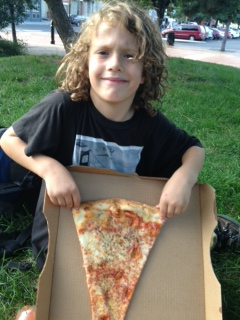 What a great way to share your love of pizza and help others to find yummy places to eat. Congratulations on your first post. I will share this with my students when we start back to school.